Tip: View all 45+ full-size photos that accompany this review on our Skipper Canteen page. 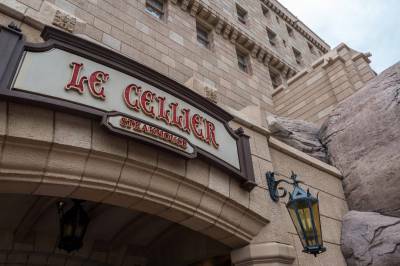 As fans of the Jungle Cruise—and adventure in general—we were excited to dine at this new Jungle Cruise-themed restaurant in Adventureland in the Magic Kingdom. As the story goes, Dr. Albert Falls started the Jungle Navigation Co. Ltd. in 1911, a cargo company for his fellow adventurers. His niece, Alberta Falls, took over the business and started offering Jungle Cruises to visitors, and then later opened up the home office to feed hungry travelers. Food is served in the Jungle Navigation crew's mess hall (the large main dining room), the old family room (the Jungle Parlor), and Dr. Fall's secret meeting room behind the bookcase (the S.E.A. room). Your servers are off-duty Jungle Cruise skippers, and they tell jokes just as corny as those you'll hear on the Jungle Cruise. Food is evocative of one cruisers may have found along the Jungle Cruise rivers: Asian, African, and South American. That's the quick description, but let's take a closer look. 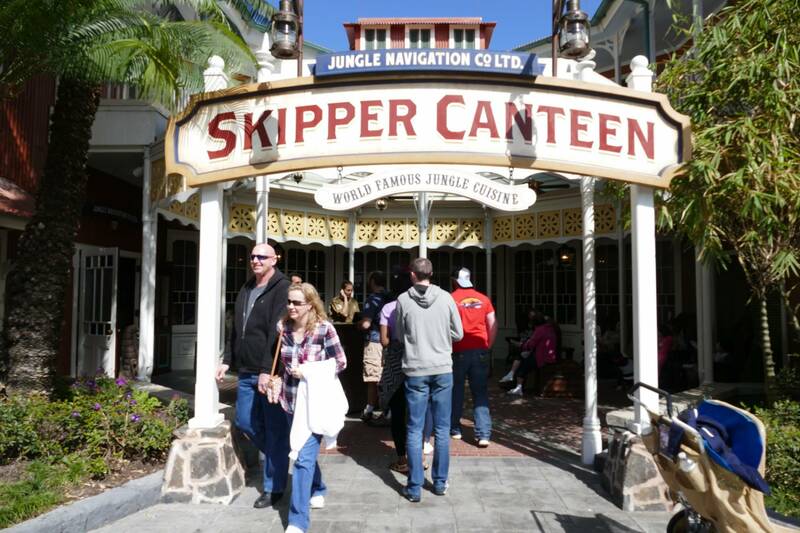 Skipper Canteen is located in Adventureland in the former Adventureland Veranda location, which closed in 1994. As you enter Adventureland from the hub, you'll find it on the right, just past the Sunshine Tree Terrace. It's tucked in a bit, but look for the big sign out in front of its pretty covered veranda. Once we arrived, we walked up to the podium. We were lucky enough to have gotten a reservation that morning, during the same-day reservation testing window. Those who did not have reservations were being quoted a 90-minute wait. We were given a pager and asked to wait in the large veranda. After about 15 minutes, we were shown to another waiting area, just inside the restaurant. This room—Porter's Post—also has seats and the walls are covered with art. Note that there is a door at the end of the room that leads to a quaint verandah looking out onto Adventureland—there were only two seats there, but it looked like a charming place to wait. We were only left waiting here for about five minutes on our first visit (a very busy day in the Magic Kingdom). Soon enough a skipper arrived, called our names, and led us into the mess hall, which is the large, main dining room. Everyone passes through the mess hall, even if dining in one of the two ancillary rooms. Our skipper cracked a few jokes on the way to our table, but honestly it was too noisy to really hear what she was saying, which was a shame. We were seated at a table in the middle of the room, which was a good vantage point for the entire restaurant. 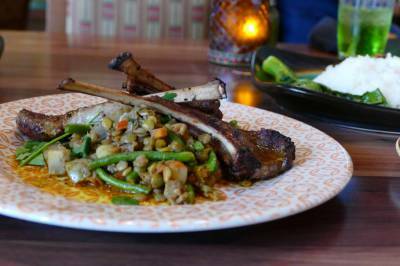 The Skipper Canteen menu is filled with fun dish names and some silliness. The inside pages of the menu both flip up to reveal a letter (on the left) and a drawing (on the right). The letter is from the owner, Alberta Falls, and explains the restaurant's story. Our skipper/server brought us some delicious Ambasha "celebration" bread and honey dip. Ambasha is an Ethiopian bread served on special ocassions. And, oh, this was delicious! We all loved the cardamom-seasoned, slightly-sweet bread and fennel-infused honey dipping sauce! The two flavors together were perfect. There are no alcoholic drinks served at Skipper Canteen, but they do have some fun soft drinks. Specifically, you can order the Fanta Melon Frosty from Thailand, which you may be familiar with from Club Cool. We also tried the Schweitzer Slush with apple boba balls ... that was also very good, especially the little boba balls which pop in your mouth! The drink itself is frozen apple juice and passion fruit, while the drink's name is a nod to Schweitzer Falls (as seen on the Jungle Cruise). For an appetizer, we shared the S.E.A. Shu Mai pork dumplings. They were very well prepared, if a touch spicy, and were devoured in short order. For our main course, we ordered the Grilled Lamb Chops, Char Siu Pork, Trader Sam's "Head-On Shrimp", Tastes Like Chicken - because it is!, Skip's Mac & Cheese. The Grilled Lamb Chops were pretty good—well prepared and seasoned. They came with a lentil stew that was so-so. The Char Siu Pork was overcooked and dry, despite being marinated. The spices were a wee bit too unusual for our American tastes. It wasn't inedible, but it wasn't a joy either. Trader Sam's "Head-On" Shrimp were tasty, but the portion seemed skimpy for the price —too much rice, not enough shrimp. The chili-garlic sauce was not spicy, which was a good thing for our 11-year-old's palate. Skip's Mac & Cheese was my favorite. It may not look like a big portion, but I was unable to finish it. The "spiced ground beef and pasta" reminded me of chili mac & cheese. Served in a Béchamel cheese sauce. Yummy. "Tastes Like Chicken" - because it is! Marinated and served with a Hoison sauce. This was better prepared than the disappointing pork from our first visit, but, again, smaller portions than one expects from a theme-park restaurant at Disney. 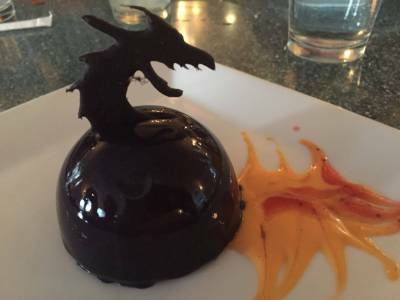 Skipper Canteen also has a number of desserts, but we were too full from our entrees to even consider them. That will have to wait for a future visit. But if you're looking for a recommendation, I hear the Kungaloosh is very good! That's what I plan to order next. I took a walk about the Skipper Canteen to look into the Jungle Parlor and S.E.A. Room, as well as see the Jungle Cruise-related touches around the restaurant. 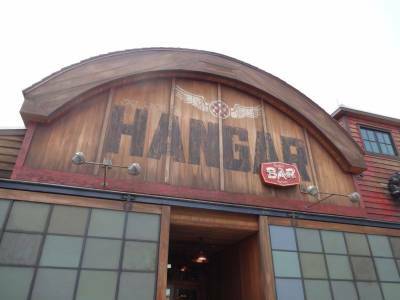 The doors on the balcony in the Mess Hall are named after imagineers who worked on the Jungle Cruise! The toolbox on a shelf in the Mess Hall here was my favorite detail. The name on the toolbox is "J. Lindsey" and a sticker reads, "Warning: May Contain Live Snakes." J. Lindsey surely stands for Jock Lindsey, of Indiana Jones fame (proprietor of the Hanger Bar in Disney Springs), and he did indeed have a pet snake named Reggie. 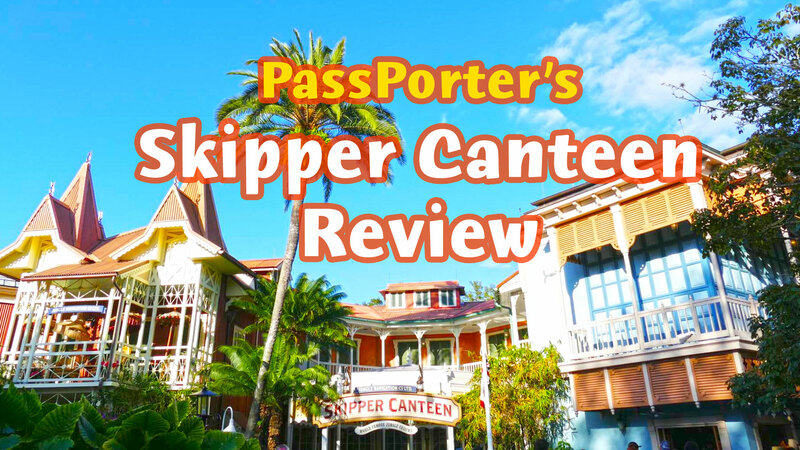 Overall, we really enjoyed our visits to Skipper Canteen and we recommend it. If possible, try to get reservations. While they weren't offered in the first couple of months, they are currently available on a same-day basis until February 27, 2016. After that, who knows! 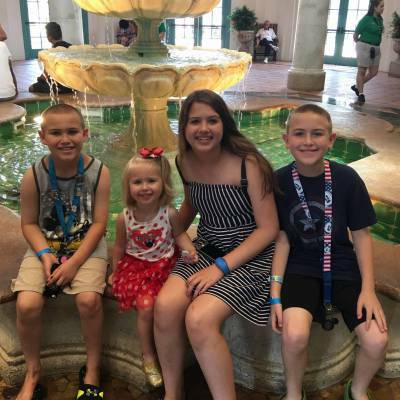 About the Author: Jennifer is the author of many PassPorter titles and LOVES to visit Walt Disney World!